This new book has only the most tenuous connection with the FNL although the cover does show a satisfyingly Scottish-looking M7 0-4-4T designed by Dugald Drummond, latterly of the LSWR. On p33 we find: "For those who might be amused at the idea of a competition to find the shortest luxury train journey it was possible to make in Great Britain the palm has to be shared, it seems, by our Town - Pier journey and that between Invershin and Culrain on the Far North Line that connects Inverness and Wick in Scotland. 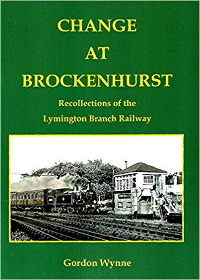 In both cases the stations are only half a mile apart, at the two ends of a viaduct over a tidal estuary, the Lymington River in the one instance and the Kyle of Sutherland, the River Oykel, in the other. On the face of it the Scottish candidate wins because catering trolleys still run in the trains, but only at Lymington was there a station bookstall where you could buy a book or paper to while away the journey. At neither end of the Oykel Bridge is there a bookstall such as we had under the overall roof at the Town. The serious point here, easily appreciated by those who know the Branch well, is that a great railway journey does not need to be a long railway journey." "Incidentally the closest station pair is now on the Cardiff-Coryton line - Ty Glas, opened 1987, and Birchgrove are just 340 metres apart."